Bluesound Pulse Mini 2i review | What Hi-Fi? It isn’t easy being the middle child. While the eldest gets privilege and responsibility, and the youngest is perennially cosseted, the middle child has to cut its own path to success. While the Pulse Mini has previously lived under the shadow of the high expectations of its talented siblings, its big brother falling on hard times means this particular middle child is left to champion the Bluesound family name. The Pulse Mini 2i hasn’t undergone the same amount of changes as the Pulse 2i, which essentially has had a complete makeover, but it has made its own significant steps toward improvement. For a start, it now houses a pair of 10cm woofers for true stereo performance, where previously there was one. Bluesound has also swapped out the 5cm full-range drivers for 2cm tweeters and doubled its amp output – now up to 100W – for a more powerful performance. The company has always been proud of its accommodation of hi-res files, including the ability to stream MQA, and has now added Apple AirPlay 2 and updated to two-way aptX HD Bluetooth. The Pulse Mini 2i can also receive Bluetooth signals and send them out to your wireless headphones. The Pulse Mini 2i also retains its ethernet connection – which sits at the back of the unit alongside USB, analogue and optical inputs and a headphone out – but is now capable of dual-band wi-fi for more stable streaming throughout the Bluesound network. 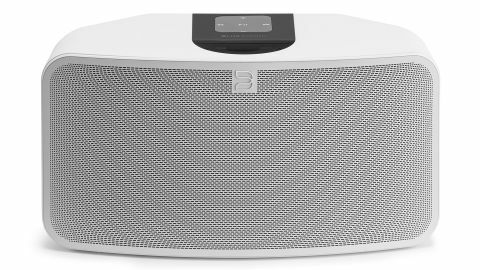 To say the Pulse Mini 2i is now Bluesound’s finest performing wireless speaker simply because of the Pulse 2i’s fall from grace would be unfair. While its star rating mirrors that we gave its predecessor when retesting it against the competition earlier this year, this new generation does mark another step forward. It begins with a cleaner, more detailed presentation. The added power is unmistakable, and the Pulse Mini 2i resembles a much bigger speaker in terms of muscle and bass response. However, it is the insight that pleases us most. Where before its presentation had appeared more condensed, and treble marginally rolled off, the Pulse Mini 2i has a more spacious soundstage and a greater level of analysis to make full use of the hi-res files it is able to decode. There have been improvements in terms of timing and dynamics too, with tracks better organised and strands better stitched for a more cohesive and entertaining performance. If its previous incarnation sounded somewhat muddled when pitted against current class leaders such as the Audio Pro Addon C10, the Pulse Mini 2i now feels more confident in such company. However, it still trails a little way behind. No longer are the differences so clear, but they are noticeable. It makes them more difficult to ignore when you consider the Pulse Mini 2i’s £499 price tag makes it just short of £200 more expensive than its rival. While it matches, or even surpasses, its main rival for authority, and comes close in terms of detail and scale of its presentation, the Pulse Mini 2i is still less rhythmically adept and lacks the expression required to become a true five-star product.